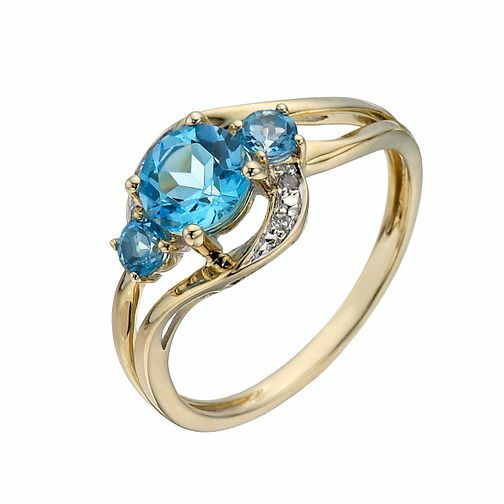 This polished 9ct yellow gold ring dazzles with a trio of vivid blue topaz. With a twisting, open design and a wave of glittering diamonds, this ring offers a modern take on the classic combination of diamonds and gold. 9ct Yellow Gold Three Stone Blue Topaz & Diamond Ring is rated 5.0 out of 5 by 4. Rated 5 out of 5 by Anonymous from Great ring but didn't come with gift packaging The ring is excellently made and very beautiful. However, it didn't come with the gift packaging I paid for. H Samuel have been helpful and apologised and are refunding the packaging cost, but it's a shame as the ring was a present. The topaz stones are stunningly blue and nicely set. Rated 5 out of 5 by Anonymous from This ring is beautiful Bought this ring to celebrate the 30yrs since I had major life saving surgery. Beautiful ring and beautiful reminder that life is precious.